Dr. Kenneth R. Brown is a native of the Steele Creek area of Charlotte, North Carolina. 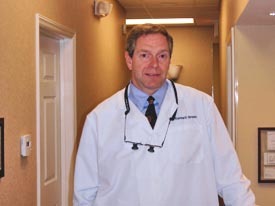 He attended college at Appalachian State University and then The University of North Carolina, where he graduated with a Doctor of Dental Surgery (D.D.S.) degree in 1990. Dr. Brown opened his private practice that summer, which he maintains to this day. Dr. Brown has two daughters and lives with his wife in Indian Land, SC. In his free time, Dr Brown enjoys spending time with his family, collecting watches, and also enjoys wind surfing, fishing and restoring his 1965 Corvair convertible. Insurance is processed as a courtesy.